The cloverleaf eyelet stitch pattern is just one of those stitch patterns that says feminine, dainty and pretty. I just love it. This is a lovely stitch pattern to use instead of Stockinette stitch if you want to add a little bit more fun to your knitting plus add a dainty touch to what you're knitting. It's not very difficult to tackle either plus it's a way to practice your two basic decreases, the K2tog and the SSK. 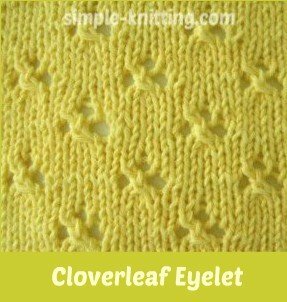 And once you've done a couple of pattern repeats you'll find that the cloverleaf eyelet stitch is quite fun to knit. This stitch pattern is kind of nostalgic for me. It's actually the very first stitch pattern I used so many years ago when I was just a child. I wanted to knit something for a friend and I was nine years old at the time. My parents friends were going to have a baby and I just had to knit something for the baby so I made a whole set, sweater, bonnet and bootees. Wow, it was so cool and pretty too. This stitch pattern is kind of nostalgic for me. It's actually the very first stitch pattern I used so many years ago when I was just a child. You see I wanted to knit something for a friend. I was nine years old at the time and my parents friends were going to have a baby. Well I just had to knit something for the baby so I made a whole set, sweater, bonnet and bootees. Wow, it was so cool and pretty too. So what else can you make with this lovely stitch pattern? Just about anything. You can dress up a plain Stockinette stitch sweater or make hats, cowls, socks, blankets, handwarmers, dresses and oh.. can you imagine a lovely shawl? Whatever you do decide on I'm sure it will look stunning. yo – yarn over – Bring yarn to front of work just like when you do the purl stitch. If you'd like to try knitting a swatch you can cast on 15, 23 or 31 sts. I worked out the math for you. These 12 rows make this lovely pattern.